A second flag for Saudi Arabia? Description: Green flag with a white shahada and sword. The hoist of the flag shown above should be at the viewer's right, as it is the case for all flags featuring Arabic writings (which read from right to left). Use: on land, state and war flag, at sea, state and war ensign. In The International Flag Book [ped71], Christian Fogd Pedersen gives the date 1946 for the adoption of the national flag (with the older pattern of sword). 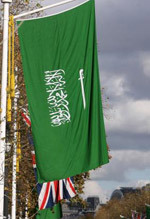 The current design of the flag was established in Article 1 of Cabinet Decision 101, as approved by a Royal Decree dated 15 March 1973, and further specified by Mandatory Standards issued by the Saudi Arabian Standards Organization, approved by the board of directors 25-5-1404 A.H. (26 February 1984), published in the Official Gazette of 10-8-1404 A.H. (11 May 1985), and with an effective date of 2-10-1404 (2 November 1984). I also have another possible date for flag legislation of 22-10-1377 A.H. (12 May 1958), with a decree number 38 [content of the decree not reported – Ed.]. The Dorling Kindersley 1997 Ultimate Pocket Book of Flags [rya97] mentions that the current version of the sword was adopted in 1981, and that it represents the sword of king Abd al-Aziz, given to him by his father. However, Dorling Kindersley's flag books are not the most precise vexillological source – actually they should be called DK's handbook of flag urban legends. So most probably the 1981 date is a mistake and bears no relationship with any adoption, either de facto or de jure, of Saudi flag elements. If the sword was adopted in 1981, it apparently wasn't by legislation, because the only law mentioned in the Mandatory Standards (which themselves formed part of the law after 11 February 1984) is the Decree of 1973. Figure 2 and Table 8 of the standards give precise geometric instructions for the sword, which the original decree did not. The point of the sword always points to the viewer's left, no matter what side of the flag you're looking at. The sword points in the direction in which you read the shahada--right to left. Since 25th May 2011 the six GCC countries decide to fly the GCC flag alongside their national flags according to the decision by the origanization. For Saudi Arabia: PMS 355 green. The vertical flag is simply the horizontal version turned 90 degrees anti-clockwise. Both sides are identical. The sword on the national flag is not slightly curved, but is entirely straight-bladed according to a precise construction diagram contained in Mandatory Standards effective 11 March 1984. According to both the Law of 1973 which regulated the design and the Mandatory Standards mentioned above, the sword's hilt is always to the right on both the obverse and reverse of the flag and is never reversed. 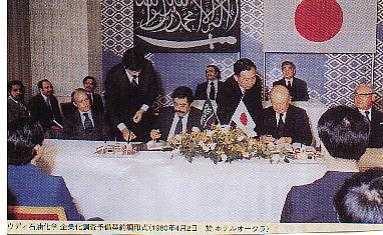 At a business ceremony in Tokyo on Apr 2 1980, they still used curved sword. I saw a documentary about two English guys who flew around the world (in 80 days) on a microlight. They had to get customs clearance in Saudi Arabia, and when the camera rolled – right there behind the customs officials was Saudi Arabia's National flag with – a curved sword! The Shahada was smaller too. The inclusion of sacred Islamic Text on the flag of Saudi Arabia has created problems when the flag is reproduced on souvenir items or as a throw-away hand-waver. An example of this problem occurred when Muslims complained of the flag appearing on World Cup footballs. I recall that one solution was to reproduce the flag with only the sword, deleting the text. However I cannot locate any source for this approach. Does anyone know if this or of any other approach to including Saudi Arabia in a flag display without giving offence to devout Muslims? If the sword only is used, is it centered? Flags are not flown at half-mast because the green Saudi flag is inscribed with Islam's testament of faith and lowering it would be considered blasphemous. If made according to law, the Saudi national flag should be identical on both sides, i.e., with the Testament or shahada reading from right to left and the hilt of the sword hilt to the right, under the beginning of the inscription. The flag therefore, looks the same whether it is the obverse or reverse which is being shown – the only way to tell which you are viewing on an image of the flag is to show a flag pole or halyard along with the image. Article 1.1 of Decision 101 (8 March 1973) is specific about this, and states that "The Testament and sword shall be clearly shown in white and appear identical on both sides of the flag." The legal position is further clarified in "Mandatory Standards" (enforced 3 November 1984) in which Article 3.3.1.1 states that, "The body of the flag shall be composed of two layers of green fabric, printed on them El-Shahada and the Sword in white (as per figure 1)." Based on description above, shouldn't both sides of the flag be identical except for the location of the flag pole? According to the Law (of Saudi Arabia) copies of which I have on file (and have quoted in the past), Lorraine is perfectly correct and our image [was] incorrect. I was not checking the mentioned law, but I believe it is so. I believe that the Antonio's image was made to illustrate one of the variants of the reverse, i.e. not all flags are made according to the law - sometimes the flag with the sword part is made printed and inscription part is the appliqued on a green patch only to be correctly readable, so gatting the illustrated flag. Other techniques may be used as well, but following the Law the design should be as pointed out. Actually, the official Saudi hanging flag reads correctly and has the sword underneath the shahada, just like on the flag. In other words, take a Saudi flag and make it longer than wide with the heading at the top and you would have it. "Indeed, at least four countries, namely Brazil, Pakistan, Saudi Arabia and Sri Lanka, explicitly forbid vertical display of their national flags." If so, we can ask what this vertical flag is? Indeed, there has been a tendency of vertical hoisting of flags recently, especially at big international events like Olympic games, and in several such occasions the vertical Saudi flag was surely used. Is it the official design, officialized recently just for that reason, or is it only an unofficial rendition of the Saudi flag made by foreign flagmakers, as a way to display the text rightly? That is, is this an official design, a de facto flag or simply an erroneous design that might have been used somewhere? I have the idea that Saudi law prohibits the vertical hoisting of the normal flag, because the writing would become illegible. Maybe the design with the writing set horizontally across the middle of a vertical flag is done not in spite of this legal provision, but because of it. I am not sure that the religion prohibits writings from the Quran from being written vertically. If I am not wrong, the inscriptions, in various ornamental forms, are used throughout the Muslim world as a very developed form of art, and scriptural ornaments are to be found in many places. So, if there is a ban on vertical hoisting of the Saudi flag (and it seems there is), that would be for other reasons – first due to the design that is not suitable for vertical hoisting, and second, and not quite unrelated with the first, due to the apparent tradition of "horizontal-only" hoisting of flags in the Arabian Peninsula. Comparably, there are bans on vertical hoisting in Pakistan and Sri Lanka, as mentioned above. These flags are not to be hoisted vertically for the same reasons as mentioned above, and not due to religious reasons. Other flags in the same part of the world are rarely if ever seen vertically hoisted in their own countries – and without any religious reason behind it, and even without the "designwise" problems. 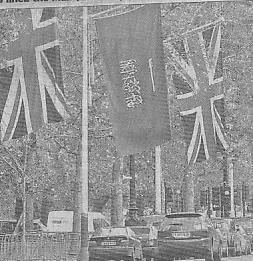 The Mall in London has been lined with flags for the State Visit of King Abdullah bin Abdul Aziz al Saud; alternate Union Jacks and Saudi Flags hung vertically on short almost horizontal staffs. If the unsupported end of the staff is considered to be the 'top', it would seem that the Saudi flags have been hung 'upside down' as the sword is at the unsupported end and the inscription at the supported end of the staff ? A photograph from Tuesday's Daily Telegraph. Yes the flags are upside down on one side (they are fully double sided). Apparently the Saudi Embassy in London agreed the design and had officials present when the flags were hoisted and they approved the "look". I can only think they considered the flags to be vertical flags and decided that it was better for the Shahada to start at the "top" on both sides. If the flags had been made conventionally the Shahada on the Western-style obverse would have started at the "bottom" and read up. The side of the flag we can't see is what you would expect from a conventional Saudi-flag reverse. As the flags are double-sided the writing reads correctly on both sides, with the hilt of the sword being under the initial letter and the blade pointing in the reading direction. This was also reported in the Scotsman, along with a colour photograph, and on MSN with the same photo. The Saudi Arabian flag is only allowed for official purposes. Private citizens can fly a plain green flag with a golden palm tree over two crossed swords in the upper fly corner. We have a World Cup promotion poster in Japan which shows 32 national people with their national flag paintings on their faces. Only Saudi Arabia does not use the national flag but a green flag charged with a yellow palm above two crossed swords. The only mention of a "civil flag" I can find in Saudi Arabian flag legislation is contained in a Mandatory Standard ("Dimensions, Geometrical Details and Usages of Flags and Banners of the Kingdom of Saudi Arabia") whose date of enforcement is given as 3 November 1985. This is the Civil Ensign (described in the Mandatory Standard as the "commercial flag") used by merchant vessels at sea. There is no other which might conceivably be considered as a civil flag. 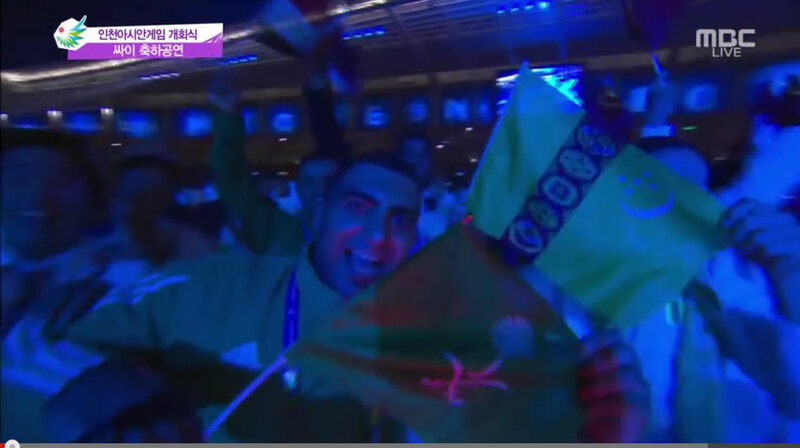 I have attached an image of a flag seen in a clip PSY Champion & Gangnam Style - INCHEON Asian Games Opening Ceremony 2014.09.19 of the 2014 Asian Games opening ceremony. It shows the Saudi Arabian emblem/coat of arms on a green background. I have never seen this as a flag. I don't know if the usual Saudi Arabian flag was used for the actual athletes parade as there doesn't seem to be a video of this available. It might be the reported Saudi Arabian Civil Flag, although the quality of the photo makes identification difficult. While this boy holds this flag by both hands, flagpole is on his right hand, and he grasps upper right part of the flag with his left hand, it seems that this a green flag with a yellow Saudi emblem placed in the middle of this flag. "A serious decision has been taken by the Saudi authorities to come up with a second flag for Saudi Arabia � one that presents the most significant aspects of Saudi Arabia as a symbol of union so that it could be used in sports events and other occasions. This statement was given by Sheikh Abdallah Saleh Al Otheimin, who felt that the current flag is being degraded by events like Star Academy & other similar programs. It seems the Saudi citizens are glad to hear this news, because after seeing a singer or dancer holding the flag & dancing around � they would rather have it changed!" I have not found this information anywhere else but I do not have access to Arabic-speaking sources. On 21 May 2008, Farouk Saad Hamad al Zuman reached the top of Mount Everest as the member of an international expedition. The first Saudi to reach the highest mountain in the world, Zuman hoisted the national flag of Saudi Arabia, as can be seen on a colour photography taken by Mingma Sherpa and shown by "The National Newspaper" (Abu Dhabi), 12 June 2008.
http://www.peakfreaks.com/images/Everest_one.JPG - direct link to the image, confirming that the flag has a white border / fringe all around. I just wondered, is that white fringe or border official in any way ? I don't think so. This may have been manufactured for aggressive weather conditions (which we would expect on Everest). Perhaps the "sleave" is extended around 4 sides to prevent the flag from becoming frayed in the wind. I don't think its a "sleeve" on the other 2 sides as it look already frayed. More likely its a fringe for decoration.